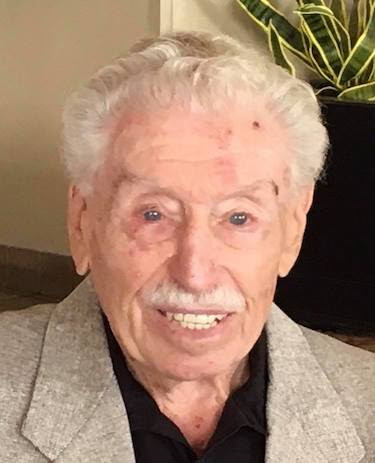 Marvin P Winchell “Marvelous Marv”, 91, a 23 year resident of Las Vegas, passed away February 26, 2018. Marvin was born March 12, 1926 in Chicago IL, moving to St. Louis as a baby and later to Los Angeles. Marv served in the Army during World War II. He worked for the US Post Office, then was the comptroller/owner of Sanico, a family industrial chemical company in Los Angeles, and was part owner and operator of Bat Kol Funeral Services in Los Angeles. Marv was a Mason for over 50 years, a past Master of Home Masonic Lodge #721 in North Hollywood CA, a past Patron of Home Chapter #592 Order of the Eastern Star, a 32nd Degree Mason, and a member of Al Malaikah Shrine. He was Director of the Al Malaikah Shrine Drum and Bugle Corps and Secretary of Home Lodge, each for 10 years. He was also a member of Daylite Lodge #44 in Las Vegas NV. He was a member of the Jewish War Veterans in Las Vegas. An avid handball player for over 80 years, Marv traveled around the country and the world playing tournaments and winning 3 World Championship titles. He also loved to play golf and softball. An accomplished musician throughout his life, he continued to play in a number of local musical groups after moving to Las Vegas. Marv is survived by his children Debra (Edmond) Kessler of Las Vegas and Joe Winchell of Las Vegas; grandchildren David (Stephanie) Winchell, Jennifer (Todd) Greenberg, Shauna (Greg) Frost and Jason Kessler; great grandchildren Alden Winchell, Raya Winchell, Callan Winchell, Zachary Greenberg, Brayden Greenberg and Elliana Frost. He was predeceased by his wife of 68 years Eleanor Winchell. A funeral will be held at 12:00 pm on Monday, March 5, 2018 at the Southern Nevada Veterans Memorial Cemetery, 1900 Veterans Memorial Drive, Boulder City, NV.